A Happy Healthy Mummy: Let them eat cake (strawberry gateaux to be precise)! Let them eat cake (strawberry gateaux to be precise)! I don't make a lot of cakes for two reasons - one is that I try to follow a low-fat diet (and when you bake you get to see just how much butter you are using thereby ruining any chance of enjoyment) - and the other is that neither my girls or I like cream, butter cream or icing. This pretty much rules out enjoying the whole 'pretty cupcake' culture - although we do all like a chintzy tablecloth, a posh tea set and a layered cake stand! Sometimes the children even fight over the 'honour' of laying such a table. Although I'm quite down with healthy muffin recipes, using oil, mashed bananas or yoghurt instead of a solid fat, I haven't really experimented with virtuously made-over cakes. Until now that is! 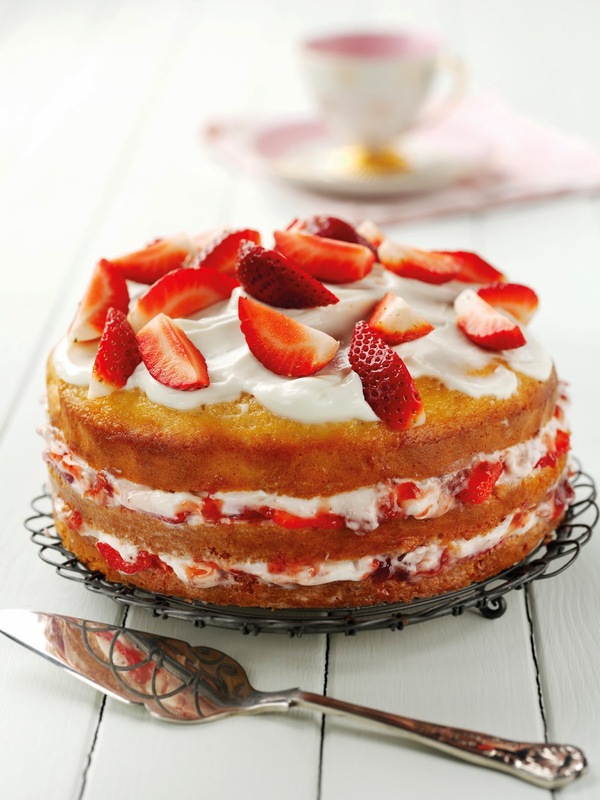 With the release of three new flavours of 'Fruyo' (a fat-free Greek yoghurt from Total), I got my hands on a low-fat cake recipe that appealed to me on all levels - not least the inclusion of strawberries and a light alternative to the fatty fillings traditional associated with sponge cakes. Just like its mummy, Total, the Fruyo pots have a high-protein content but don't use preservatives, colourings or artificial sweeteners, which ticks all my boxes! The new flavours are blueberry, strawberry and zesty lemon (there's already peach, vanilla, cherry and pineapple). Find them in Waitrose, Sainsbury's, Nisa, Wholefoods, Booths and Ocado (£1.09 per 170g pot). You could easily use any of the flavours to ring the changes with this recipe - and switch the strawberries for peach slices or blueberries to match as you fancy. The original recipe used a smaller (7-inch), round cake tin, which makes an extra layer of yummy filling possible, but I wanted to use my heart-shaped tin for a bit of pre-Valentine romance. This is best made a day ahead and stored in the fridge to cut easily. Heat the oven to Gas Mark 4/180°C/350°F fan. Fully line your loose bottomed cake tin with non-stick baking paper. In a large bowl, whisk together all of the cake ingredients until smooth. Pour into the cake tin and smooth the surface. Bake for 35-40 minutes until pale golden and just springy to the touch. Cool in the tin for 10 minutes, before removing and leaving to cool completely. Mix the Greek yoghurt with the icing sugar and set aside. Using a sharp knife cut the cake horizontally into two (or three if you are going with that option). Place the bottom half on a serving plate and top with half the sliced strawberries. Spoon over the Fruyo Strawberry and spread. (If you are using an extra layer, save some berries and Fruyo for the middle too). Add the top cake layer, and spread with the Greek yoghurt. Chill for at least 4 hours or overnight. Top with reserved strawberries and serve. Well the proof is in the pudding, and I'm pleased to say the cake was delicious! I can see it working for a tea party, with friends or even with the cake mixture used as a base for cup cakes (baking time adjusted accordingly). The topping and filling are also versatile - I can certainly use Greek yoghurt and icing sugar as an alternative to buttercream on all sorts of cakes. It's given me a real 'taste' for developing some low fat desserts. How about you? Does this cake tempt you to cook low-fat - and replace butter /cream with Greek yoghurt? Let me know in the comment box below - and l'd be interested in any other tips for making puddings a little bit healthier...a girl's gotta eat!! Love it, Vanessa! I shall try it out! It's good to know you can have your cake and eat it when you're watching your fat consumption! Thank you for commenting. I hope it lived up to expectations! I think it got even better after a day in the fridge - the Fruyo layer seemed to flavour the sponge more. Hi Emma - that's great news - thank you! The cake was incredibly delicious, even my children liked it (which is good as I didn't just gobble it all up myself...). I'll definitely try the sponge recipe again as a cupcake base, and use a bit of Fruyo as an alternative topping. I've done it again since the original - and added bit of cocoa powder in for a chic version. I couldn't get over how it improves in the fridge (the fridge which is now filled with Fruyo since the whole family loves it!). YUM! I pinned it and can't wait to try it! Thank you! And yes it was lovely. It has proved really popular actually and this recipe blog has been picked up and posted a few places too. I guess everyone wants a healthy cake!!! If they even use real butter! Im thinking low grade lard might be in cheaper products....!! Thanks for commenting. I haven't tried yogurt as a substitute yet, but this recipe sounds great! This basically provides a reason to eat cake...thanks for commenting! Take a picture of you and your child today!